This is the first time I've been back here in a long while since the CA case. I just couldn't come. So, I really hoped when I came back today I would see more progress on this HB case. So disheartening! Holly Bobo has been missing for five months now, and investigators have run out of leads pertaining to the young woman's case. As the case remains unsolved, friends and family members of the missing nursing student are planning a fundraiser. Sources say that friends and family of missing nursing student Holly Bobo will be hosting a benefit fundraiser in the girl's honor on October 1st. With the young woman's reward nearly at $100,000.00, it seems that the family is trying pretty hard to raise a large amount of money. They've been selling t-shirts and decals as well, and a recent biker rally held in Holly's honor gave all of its profits to the family. It surely seems that albeit disastrous, the disappearance of Holly Bobo has proven lucrative to a certain extent. PARSONS, Tenn. – Friends and family members of a missing 20-year-old nursing student are holding a fundraiser for her search efforts. The fundraiser, which will benefit continuing search efforts for Holly Bobo will be held in Memphis on October 1. I was driving on the interstate from Birmingham to Montgomery last week and I saw a picture/poster type advertisement on the back of an 18 wheeler. It was a photo of Holly and said Bring Holly Home - asking for information on her. Curiously, her hair was "up" in the photo. I was wondering why that particular photo of her was chosen? I certainly recognized her and knew who she was, but with her beautiful blonde hair, I questioned why they selected one of her hair up? to profile her face more? IDK - I am sure there is a reason. Maybe the poster showed her hair up, in case it has been cut or changed. Mostly her face needs to be the focus, if she is alive and might somehow be out there someplace. That makes sense to me, bebecat. Whitney Duncan will go from country singer to castaway when ‘Survivor: South Pacific’ kicks off tonight on CBS. The 27-year-old ‘Skinny Dippin” singer sat down with Country Music Is Love, where she dished about the show, her new EP, and — sadly — her cousin Holly Bobo, who is still missing after being kidnapped in April. The season premiere of ‘Survivor: South Pacific’ airs at 8PM ET tonight, September 14, on CBS. ...."and that's the last time I saw her..." IOW, that's all I am going to talk about. I get the impression that Clint was viewing this from a different place than inside the house. What does he mean by "..realized that that must have been her at the house"...this is a very strange way of speaking and leads me to believe his viewpoint was from outside the house rather than in the house. TN (WSMV) - A group of Holly Bobo's friends and family are training for the Susan G. Koman Race for the Cure 5K. A team organizer said Holly is a big reason they're running, but the purpose of the race won't be forgotten. If you would like to join Team Holly Bobo, there's an informational meeting at Centennial Park Event Pavilion next Saturday, Sept. 24 at 10 a.m.
Update on Jason Everett Nickell. On Friday, there was a sentencing hearing in Madison County Circuit Court wherein Jason Everett Nickell, 39, of Holladay, was charged with three counts of stalking. After hearing testimony from two of the women and a Jackson Police Investigator, the judge sentenced him to three consecutive sentences of 11 months and 29 days in jail. He will be eligible for release after serving a minimum of 75 % of the sentence. This was the maximum sentence allowed. He will serve his sentence in the Madison County Jail and will receive credit for time served following his April 16 arrest. ::snipping2:: & BBM. I just figured out what has been bugging me about this statement. He uses the term house dog. Does that mean there were 'yard' dogs or 'field' dogs, if so where were they? Using the term house dog seems odd to me, why not 'my' dog or 'our' dog or even i was awoken by the sounds of 'spot' or 'the' dog barking. IMO, house dog is contrived and overly rehearsed to make it seem insignificant or an all out lie to cover what truly happened. Thanks for the explanation cw! And that was part of the point I was trying to make, why the need to specify house dog. It smacks of the type of TMI that comes with lies and obfuscation. Holly Bobo has been missing now for over five months and investigators have released little to no information to the media. Still, some media outlets are trying to keep the story of the girl's disappearance alive. The Jackson Sun has been covering the case since the 20-year-old missing nursing student was first reported missing, and now they're recruiting the public for more details to keep in the media; even if it is local and on a small scale. 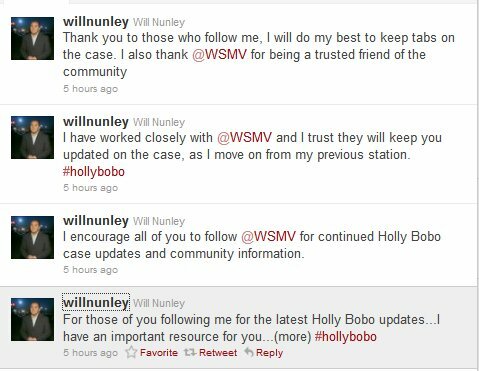 It's hard to imagine that five months ago the disappearance of Holly Bobo seemed to be booming with information and statements from the TBI and news anchors. Now it is almost as if the young woman never existed, with very few sources even mentioning her. The Jackson Sun doesn't want it to be like this evidently, and this article details that they want comments about the young woman by the 28th of this month. In particular they are wanting people to share their ideas about the investigation and details surrounding the missing Tennessee woman's disappearance. You see, since the beginning the story has been that a mysterious man in camouflage led the girl into the woods behind her home as her 25-year-old brother watched -- and didn't intervene. The story has changed a few times, but as far as the TBI is concerned, this is due to communicative issues. disappearance of nursing student Holly Bobo. disappearance and the subsequent investigation by law enforcement officials. Janet ^^^ "Now where do I start?" In case you make a decision to share your thoughts with them, here's the contact information. Jordan Buie, at jbuie@jacksonsun.com. Please have your comments in by Sept. 28." More Info Join us for a benefit event in honor of Holly Bobo's birthday! Enjoy Plate Lunches, Bake Sale, Raffle Tickets, Bracelets, Ribbons, T-shirts, Live Music, & more. All proceeds benefit The Bobo family. Volunteers & donations are still needed & greatly appreciated. or you may write on the event wall to volunteer or donate. Page created in 7.632 seconds with 20 queries.